‘I am not here, then, as the accused; I am here as the accuser of capitalism dripping with blood from head to foot,’ thundered John Maclean in his famous speech from the dock, in 1918. Acting as his own counsel, Maclean launched a Marxist indictment of the arms trade and the war he believed it had spawned. A fiery and restless teacher, Maclean’s lifelong socialism ‘matured in an instant’ on the outbreak of war and cemented Red Clydeside’s reputation as a threat to the war effort. He captivated outdoor meetings all over Glasgow – at the height of his powers addressing five a day – and worked alongside others who were more reformist in outlook, such as his friend and fellow teacher, James Maxton. Maclean was an inspiration to the Clyde Workers’ Committee and urged munitions workers to adopt a policy of ‘ca’canny’ (go-slow) so as not to bolster the arms traders’ profits. But he later distanced himself from what he saw as the Clyde Workers’ Committee’s narrow focus on shop-floor concerns rather than political opposition to militarism. Five terms of imprisonment, including a hunger strike and subsequent force-feeding, were compounded by relentless soapboxing in the bitter Glaswegian winter. On 30th November 1923 he died prematurely, aged 44. The Soviet Union (USSR) honoured Maclean’s Marxist teachings with an avenue in central Leningrad – Maklin Prospekt. It has now reverted to its original name, Angliisky Prospekt (English Avenue) – somewhat ironic as Maclean promoted Scottish independence. 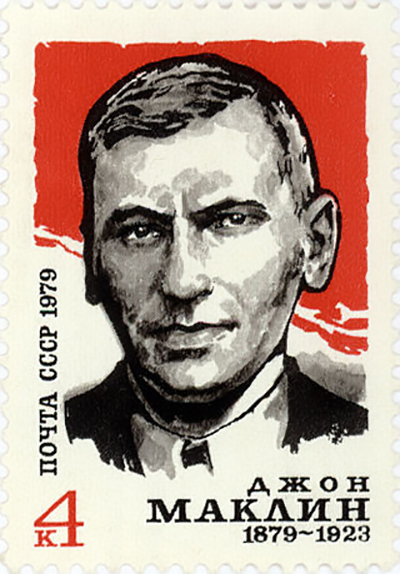 In 1979, on the centenary of his birth, the USSR issued a four-kopek postage stamp depicting him. According to Wikipedia, his legacy closer to home was almost lost when the brilliant and somewhat absentminded writer C.L.R. James left the only manuscript by Maclean’s first biographer on a London underground train. Nan Milton, Maclean’s daughter spurred a Maclean revival in the 1970s. 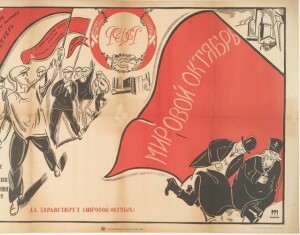 Left-wing theatre company 7:84 staged The Little Red Hen and The Game’s a Bogey concerning his milieu, while Anderson’s Krassivy (‘both beautiful and red’) and Alistair Hulett’s popular songs kept his memory alive. Debates still rage on the left about Maclean’s mental state in the final years of his life. Some attribute his pointed disdain for leaders of the newly formed Commmunist Party to ‘paranoid delusions,’ first manifested in allegations of prison officials poisoning his food. Others claim his criticisms were prescient. Maclean was the first person arrested under the Defence of the Realm Act (DORA) in October 1915 and spent five days in prison rather than pay a fine for uttering statements prejudicial to recruitment. DORA gave the government sweeping emergency powers to requisition property, seize resources, censor, and prosecute people for a broad range of acts deemed to undermine the war effort. He was deprived of his liberty again in February 1916. This time he pleaded not guilty to six separate charges of sedition, all related to public oratory. The case for the crown was presented by three police detectives who variously claimed they had either forgotten to bring their notes to court or had destroyed them. The notes they did produce were not very detailed (‘a word here and there on a scrap of paper’) and barely legible. The court papers detailing the witnesses for the defence suggest that many of the charges brought against him were trumped up. 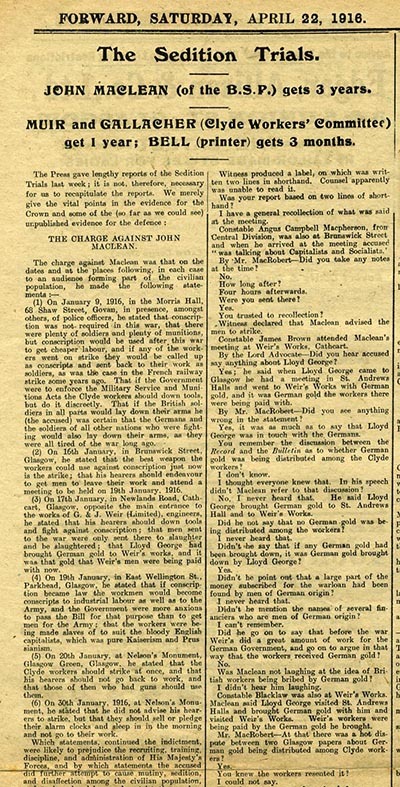 A study of the defence witnesses’ accounts consistently suggests that the third charge is falsified (there is no evidence that Maclean said workers should down tools) and that the clause claiming Maclean accused Lloyd George of using German gold was taken out of context. What Maclean actually said was that the war loan was backed by German financiers such as Rothschilds and Schroders. The sixth charge, which describes Maclean encouraging workers to pawn German-made alarm clocks and sleep in, is unanimously reported as a joke by all the witnesses apart from the police. The Charges were listed in Forward newspaper (above-right). Clydeside industry had the highest concentration of industrial workers in Europe, which gave rise to anxiety that it could become Britain’s Petrograd. Perhaps with this knowledge we can understand why Maclean was sentenced to three years penal servitude. The jury did not retire and it was the last time that Maclean allowed lawyers to represent him in court. The composition of the jury is unknown, but the defence witnesses were all workers, and arguably, the authorities were keen to discourage Maclean stirring up dangerous opposition to the arms trade among the proletariat. Maclean did not serve out his sentence. The Russian revolution generated strong agitation domestically and in Russia, and there was widespread popular demand for his release. MacCallum Scott (Liberal MP for Bridgeton), Philip Snowden (Labour MP for Blackburn) and the British Socialist Party also worked hard to secure his release. It was at the Consulate that Maclean was arrested again on May 9th 1918 for sedition, culminating in his filibustering speech from the dock. This 75-minute oration is one of very few transcribed – usually he made no notes. He analysed the multi-national arms industry. He declared himself disinterested in national victory, preferring victory for the workers in the form of a worldwide communist revolution. ‘I have squared my conduct with my intellect, and if everyone had done so this war would not have taken place…’ he continued. Maclean seized a rare opportunity to fulminate against militarism before the media, rather than defending his own interest in walking free. He was sentenced to five years penal servitude for his boldness, but only served his sentence until the end of 1918, aided no doubt by weekly demonstrations demanding his release. Read more about John Maclean’s milieu in ILP Rebels on Red Clydeside. Glasgow today lives up to its radical past – a street poll asked people what they would buy with the £2.5 billion recently allocated to new fighter jets. This is how Glasgow voted: 33 votes for nurses, 28 for public homes, 16 for teachers, only one for fighter jets.